Spiderlegs® are handcrafted collapsible folding tables. 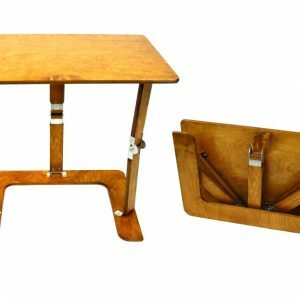 Made from quality woods, a Spiderlegs® folding table can be used for extra dining, extend your dining table, games, puzzles and projects at home. They’re great for temporary desk space. Use them as an RV table, Motel table, elegant camping table, outdoor table you can easily put away, concert in the park, a display table, contractors table, artists table, tailgating table, boat table… You are limited only by your imagination. 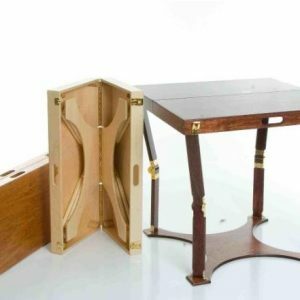 Spiderlegs® tablescollapse into a wonderfully portable “suitcase” that can be easily stored or transported between uses. Spiderlegs® work well on many uneven surfaces as the base flexes slightly with the ground. 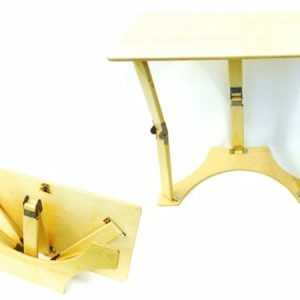 Spring loaded locking hinges keeps the table open when you want it, while depressing the buttons releases each leg allowing easy breakdown.